The Dowelmax™ Classic 3/8 is a highly versatile and adjustable dowel joinery system that creates the strongest, and most accurate joints available on the market, which have been independently destructive test proven to be stronger than any comparable mortise, or domino joint. 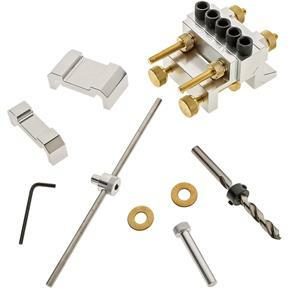 Dowelmax is capable of performing virtually any joint configuration from 3/4" x 3/4" to 4 x 4, and of any length. The device can be disassembled and rearranged to perform: edge to edge, end to edge, end to face, 4x4's and miter joints for picture frames. Spacers can be used to center on wood of any thickness, or to create a relief, or offset. The distance gauge accessory is used for longer boards, and the indexing pin for wider work piece applications. Double and triple row dowels can be utilized for applications in thicker work pieces. All applications are accurate to within thousands of an inch, and most joints can be completed in less than five minutes. An optional angle bracket is available for T-type joints. An optional miter accessory is available for miter joints for blind or through drawer corners, and other similar miter applications. The system is accurate, versatile, reliable, and fast and is intended for use by both beginners and professionals. All Dowelmax components are CNC machined from top quality 6061-T6 aluminum, hardened steel and C36000 brass materials, with tolerances of within .002".